The classic lines of the Nobel Master harbour a wealth of cleverly orchestrated details. The dial centre features graphic decorations creating an elegant contrast with the rounded rim graced with spark-ling diamonds set around the hour-markers. A dial opening at 12 o’clock provides a glimpse of the automatic movement that can be viewed in full through the sapphire caseback, where this fine mechanism reveals all its beauty and its secrets as it marks off time in a manner imbued with masculine sophistication. 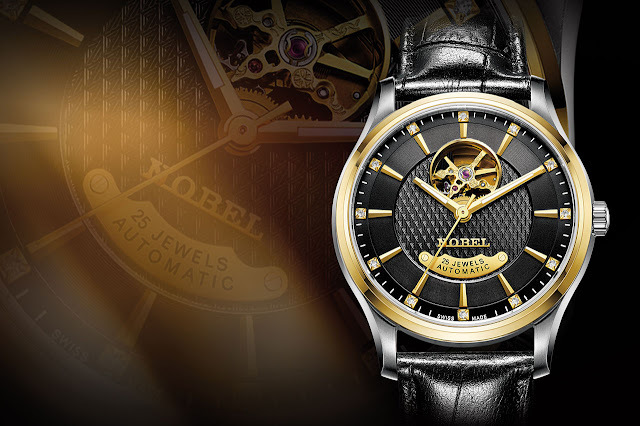 The steel case of this refined watch is topped by a yellow gold-toned bezel, while a leather strap sets a handsome finishing touch.